I follow the blogs of Mel Wiggins and The Owl and the Accordion written by Victoria, both are great blogs and have interesting, thoughtful pieces along with show casing various ethical brands and top tips for eBay shopping. Last week I read about an idea that they had come up with together (don’t you love it when you find out your favourite bloggers are friends! ), the Ethical Fashion Collective and it immediately intrigued me. Basically it is an idea to save some space online to show off and share information about ethical fashion – this includes vintage/second hand/articles/small brands/big brands – you name it! The idea is to do this on the 1st Friday of each month, and I love it! While I have my own reservations about the phrase ‘ethical fashion’ and prefer ‘ethical style’ I see no need to prescribe that to others and I’m excited to join in. This month I thought I would talk a little about my own journey into ethical fashion and do some link love for my favourite books and blogs on the subject. Remember to search on Twitter and Instagram for #ethicalfashioncollective to discover more. I genuinely can’t remember when I first started being interested in ethical fashion. I remember after my graduation from my undergraduate degree being unable to afford to replace my work trousers and having to get a Topshop card in order to be able to go into the deli I worked in without looking indecent 🙂 So it was definitely after that! For a long time I mixed high street and online ethical brands, but to be honest I never strayed too far from People Tree and I didn’t look too hard into other brands. 2nd hand and vintage were unpleasant words to me, I hated the smell of Armstrongs (a famous vintage shop in Edinburgh) – I still do actually it gives me a headache. I read books on ethical fashion and researched more about sustainable living. I bought my jeans from Howies and slowly began to transition away from the high street. Soon I was Googling ethical brands and trying to find my style online through the offerings. Sometimes I nailed it, sometimes I didn’t. Then I read To Die For and became fully converted, I used each chapter to help me decide how I would purchase clothing and where my ethics lay. I kinda continued to stick my fingers in my ears and sing la-la-la not listening when it came to leather footwear though. Next up came Stitched Up, this is really my kind of book. I am a socialist and an environmentalist combined with a feminist so all chapters in this book made we want change. Now I started to ask questions and told brands why I boycotted them. I spoke to friends and family and started a blog (though I stayed away from ethical fashion initially and focused on my riding). I joined the Wartime Wardrobe Challenge and found Meg, Jesse and Franca online. Through their blogs I started the wonderful journey into the blogosphere! 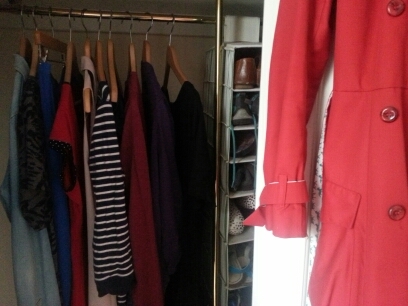 I feel there is a great community of writers out there getting conversations started and they managed to do the impossible and get me into charity shop shopping, eBay bidding and clothes swaps – thanks guys! I discovered loads of brands – my current obsession with Finisterre was started by a friend but Nancy Dee was a brand I heard of through bloggers and I have even won an Ecouture by Lund dress from another ethical fashion blogger. The Rana Plaza disaster in 2013 brought more and more people into the ethical fashion fold, more people wanting to know who made their clothing and that their clothing was made in good working conditions. Some brands have made attempts to make their supply chains more transparent and to ensure that they know the providence of their clothing but work remains to be done. I have now sworn off buying clothing from companies who don’t have clear policies in place and are able to tell me more about their clothing than the standard ‘green washing’. I also like to support smaller brands and I am fortunate enough to have the disposable income to do this. I try my hand on eBay and in charity shops most months and have definitely got better at getting real gems but it does take time. Finally, all of this interest in ethical clothing is also what prompted my interest in sewing and knitting – I’m working on sourcing materials that fit with my personal ethics and that is a work in progress. What makes all of this easier is finding my community online, finding great people who write all manner of interesting and thought provoking articles – people who challenge your personal ethics and introduce different concepts to me. I have included my favourite bloggers below but I would love to know any ones you would recommend. This is a really good book to start with, I really rate it although at times it is overwhelming when you think about the fashion industry as a whole. I have also mentioned a couple of blogs in the post that I would say to take a look at, nearly every blog mentioned does a really nice mixture of posts some have making themes others that focus on every aspect of sustainable living. *Oh and I have now given up leather however I am aware of the sustainability questions around the alternatives, it is hard to know which line to tread. Thank you so much for including Sustainability in Style in your list Gorgeous gal. I love your idea! I’m already planning next month’s post. Love your blog, I would recommend Katie’s Sustainability in Style blog so much – she is great.